Zlotta et al. first described the use of radiofrequency ablation to ablate human renal tumors in an ex vivo model and subsequently ablated human tumors in vivo immediately prior to nephrectomy (28). Although the results were encouraging the authors called for animal experiments to better characterize the effects of radiofrequency ablation on renal tissue. Walther et al. performed a similar study treating 14 tumors (none greater than 4 cm in size) in four patients with radiofrequency ablation just before surgical excision (29). No toxicity related to radiofrequency ablation was observed. They reported subtle detectable changes in treated tissue, but importantly cited that the excision immediately after ablation did not allow enough time necessary for the changes of coagulation necrosis to be seen. Gill et al. performed laparoscopic and percutaneous impedance-based radiofrequency ablation in a porcine model (24). In this report the authors described the acute ultrasonic appearance of radiofrequency ablation lesions as an irregular hyperechoic area that could not be reproducibly identified. Arteriograms demonstrated occlusion of the intrarenal vessels in the areas of radiofre-quency ablation, with a normal appearance of the remainder of the vessels. Later, this same group published the acute and chronic histopathologic effects of impedance-based radiofrequency ablation on renal tissue, observing extensive coagulative necrosis and marked inflammation in the areas of treatment (30). 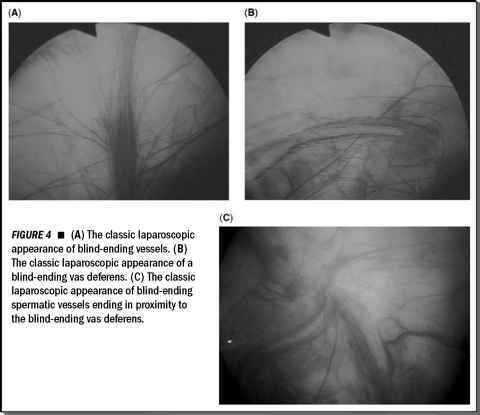 Early radiofrequency ablation-mediated changes consisted of blurring of chromatin, increased cytoplasmic eosinophilia, loss of cell border integrity, and interstitial hemorrhage. As time progressed there was degeneration of nuclear and cellular features and an inflammatory infiltrate at the border of the lesion. Ultimately they observed spontaneous resorption and autoamputation of the treated portion of the kidney. Corwin et al. (23) evaluated the tissue effects of temperature-based radiofrequency ablation with and without hilar occlusion. This study investigated the effect of any heat sink phenomenon due to renal blood flow in a porcine model (23). Acutely they observed coagulative necrosis within the ablated lesion with preserved renal architecture and minimal cellular changes, consisting of loss of distinct cytoplasmic borders, variable appearance of nuclei, and increased eosinophilia. Importantly, nicotinamide adenine dinucleotide staining confirmed complete nonviability in all parts of the radiofrequency ablation lesion. Although hilar clamping caused a slight increase in lesion size, the difference was not statistically significant. Furthermore, clamping did not appear to have any effect on tumor viability within the radiofrequency ablation lesion, as complete cell death occurred regardless of hilar occlusion. However, in some cases, hilar occlusion resulted in unpredictable lesion size and large parenchymal infarction. Little experimental data exist regarding the oncologic adequacy of radiofrequency ablation as a primary treatment for renal tumors. The lack of comparable animal models for renal cell carcinoma makes this difficult to obtain. Nakada and coworkers evaluated the efficacy of radiofrequency ablation, cryoablation, and radical nephrectomy as treatment for implanted VX2 tumors, an aggressive tumor model, in rabbits (31). They found radiofrequency ablation, cryoablation, and nephrectomy to be equally efficacious in treating these tumors when compared to untreated controls. Our group has reported a case of nephrectomy for ureteropelvic junction almost one year after radiofrequency ablation of a renal tumor in a human patient. Microscopic examination demonstrated a giant cell reaction in the area of the ablated tumor with no evidence of residual renal cell carcinoma (32). A study by Rehman et al. recently compared the effects of microwave, cryoablation, impedance and temperature-based mono- and bipolar radiofrequency ablation, and liquid and gel chemoablation on porcine kidneys (33). Of all the techniques tested, temperature-based radiofrequency ablation (radiofrequency interstitial tissue ablation system) and cryotherapy were the only two methods to result in complete tissue necrosis with no skip areas. The authors concluded that with current technology, cryotherapy and multitine temperature-based radiofrequency ablation were the only modalities that offer complete necrosis within the sphere of treatment.